Powerflex MINI Cooper Control Arm Bushings! If you have 60K miles on your MINI, more than likely, your bushings are already blown out or on their way out. 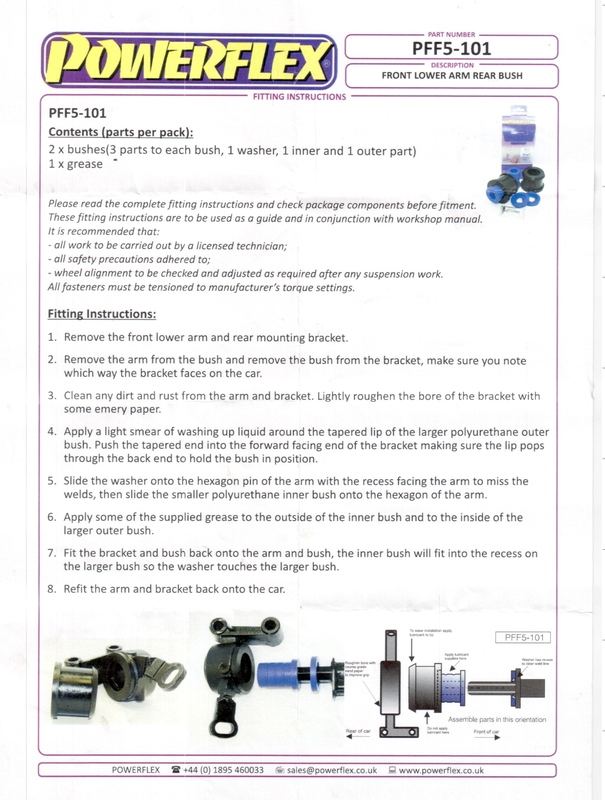 So replace your worn out bushings with these great units from Powerflex. This is a very common problem on all generation 1 cars. The rubber was too thin and when in use, they rip. Once ripped, the hydraulic fluid leaks out, the bushing dry out faster and comes apart even more. Don't worry, nothing's going to fall off, but you will lose handling and will not be able to align the car correctly until you have them fixed. This is the only bushing we install here at the shop! Powerflex polyurethane bushings are designed to decrease the amount of deflection in your car's suspension for better handling, more driver feedback, and better tire wear. Powerflex uses premium polyurethane materials for minimal NVH (noise, vibration, harshness) and increased longevity over the stock rubber bushings. Bushings come in pre-determined durometers (measured hardness) from Powerflex to work best in each particular location. The street bushing will work best for mostly everyone. They have been spec'd by Powerflex to be the best durometers for your application and are 70A (Yellow), 80A (Purple), and 95A (Black). Powerflex grease is supplied with every dynamic product. We suggest using only this grease for lubrication. Due to grooves and knurls cast into the material to hold the lubricant, bushings will rarely need re-lubing. We do not suggest using an "anti-seize" product for lubrication. Want a stiffer bushing? Have a track car? Try “The Black Series." A new range of bushings developed for Race, Rally and Circuit use. The Powerflex Black Series bushings are manufactured using a 95 Shore A compound to provide maximum control of chassis geometry. IN STOCK ready to ship! Warranty: All Powerflex bushings are made in the UK and come with a 1 year, unlimited mile warranty. Get these bushings pre-pressed into the bracket here at the shop! Just select it from the pull downs. Labor is only $20, shipping weight, & a $100 REFUNDABLE core when undamaged brackets are returned within 2 weeks. IN STOCK ready to ship! You do have to drop the entire subframe. Just get all those forum posts about not having to do that out of your head and do it. Once you commit to that, its much easier. The hardest part is getting the steering rack connected again. I ordered the pre-pressed bushings/brackets, and they were perfect. Such an amazing difference in driving. Feels like the car is new again, and back to being the go-cart I fell in love with. This is a very good quality part. The fit is perfect. Installation requires a press tool and lowering or removal of the subframe. I've installed numerous sets of these and never had a problem. NO SQUEAKING. Amazing longevity as compared to stock. I've never had a set wear out! I use them on a street/occasional track day car and have no complaints. I'd install them on my friend's, customer's, or wife's car. Detroit tuned: Fast delivery, great customer service, great options. Installation: More involved than I anticipated. I initially thought having the bushings pre pressed would save me a lot of time. If I had it to do over, I would cut the old bushings out of the brackets and press them in the car. Replacing the entire bushing/bracket assembly required the removal of the subframe and bumper guard. However, since it was all apart, I had the chance to repair other parts as well. Driving: Wheel hop is gone. Body roll is improved. I can feel the front end gripping much better, especially when cornering hard. All wheel play is gone.